Filson Beartooth Jac-Shirt. 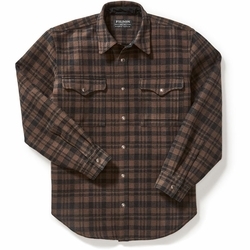 Filson's Beartooth Jac-Shirt is a versatile garment that has year-round purpose. The blanket-weight cotton fabric works as an outer layer on cool days, and can be worn under a jacket during the winter months. Outfitted with chest pockets, handwarmer pockets and a front snap closure that’s easy to use while wearing gloves.